Better waste management offers great potential to help us meet the sustainability challenges ahead. 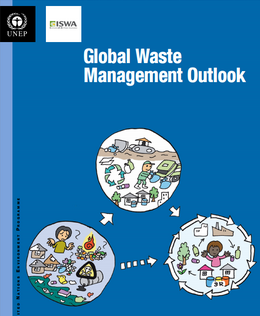 Targeting decision-makers and many other inter-connected sectors, the Global Waste Management Outlook (GWMO) was launched at the World Congress of The International Solid Waste Association (ISWA) in Belgium on 7 September, 2015 . The publication also contains two summary documents, making the information concise and accessible. Developed by UNEP in collaboration with ISWA in response to the UNEP Governing Council request of February 2013, its goal was “to develop a global outlook of challenges, trends and policies in relation to waste prevention, minimization and management, taking into account the materials life cycle, subject to the availability of extra-budgetary resources and in consultation with Governments and stakeholders, building on available data, best practices and success stories, taking into account the Global Chemicals Outlook and any other relevant initiatives and taking care not to duplicate existing information, to provide guidance for national policy planning.”. The GWMO speaks to many of SAICM’s key objectives. One example is in the area of reduction of risk from chemicals through less hazardous waste - both in quantity and toxicity - ensuring environmentally sound management of hazardous waste, its storage, treatment and disposal; and promoting the environmentally sound recovery and recycling of such hazardous materials and waste. It also complements additional SAICM objectives in the areas of better knowledge and information, governance and illegal international traffic in addressing the life cycle approach of sound management, waste governance and waste crime respectively. The GWMO is a comprehensive tool which provides an authoritative overview, analysis and recommendations for policy instruments and financing models for waste management.